Despite best efforts at labeling, reminding, scolding & bribing, my son has already lost most of the items lovingly provided to him by his hard-working parents designed to keep him warm. And it’s not even winter officially yet! Yet somehow, this understanding doesn’t translate into him stopping when relocating – for just one teeny second – to consider whether he has everything with him that he needs. Making him buy new items with his pocket money. Making all his Chanukah/birthday/Christmas presents replacements for these lost items – instead of toys. Any other suggestions gratefully accepted! Tonight, as I prepare to go to sleep once again here, I’m thankful for this bed. It has always struck me as bizarre that, when it comes to cars, there’s an especially-wide swathe of vocabulary differences between British English and American English. After almost thirteen years here in the USA, I feel like I have mastered most of these except for those that are spelled the same but pronounced differently over here, like the brand Jaguar. To me, it will always be Jag-you-are. Never Jag-war. Windscreen: yes, we call it a windscreen not a windshield. Number plate: that’s English for license plate. Manual: you call it ‘stick.’ You’ll find a whole lot more of these in the UK and Europe. In fact, most of us learn to drive manual. This makes us better multi-taskers, IMHO. Hatchback: a three-door car. Again, many more of these across the pond. After all, British streets and parking spots are narrower, so it makes sense. Saloon: not as glamorous as in the wild west, this is what we call a regular four-door car. Estate: Personally I think station wagon cars are all ugly. Also it’s such a silly word. Anorak: in case it rains. Y’all call it a windbreaker. Wellies: ditto, in case it’s rainy or muddy out. You’d call them rubber boots. Tailgating: Grilling in car parks before sports events is not something Brits really know how to do. Or why. On the flip side, we Brits do like a good car boot sale. No, this doesn’t mean selling our trunks. It’s like a big old market where everyone parks their car and sets up a booth to sell off second-hand stuff. Like lots of yard sales in a parking lot or a big field. Ok, I have eyebrow envy, I admit it. I’m not proud of this but the first step to solving a problem is admitting you have it, right? I am envious of all your lovely, sculpted, perfectly-arched eyebrows. They demand attention, they draw you in, they scream “here I am, I’m lovely, look at my eyes, look at me!” They are the frosting on your every facial expression, niftly rising up and down, as if emphatically agreeing with your smile, your snark, your shock. My eyebrows are lame, by comparison. After all, my fair British pathetic skin and reddish locks don’t lend themselves well to definition. Yes, I try. I really do. I’ve plucked, waxed with the best of them. But really to no avail. There my brows sit. Limply there above my eyes. Commanding zero attention other than, perhaps, glances of sympathy from the beautifully-browed people. Let’s consider some examples of the finest brows out there. 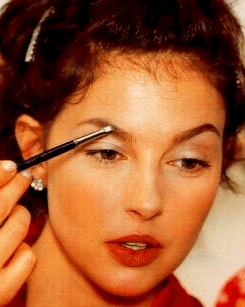 Ashley Judd’s have always been a favorite. Beyonce’s are always lovely. Rachel Weisz and Angelina’s rock. Jennifer Anniston. Of course. The list goes on and on. Several of my colleagues, both former and present (you know who you are) are also blessed with beautiful brows. I am surrounded by people whose eyebrows outbrow mine. Again, I’m sorry about my eyebrows. You may now look away.